This is an endurance challenge. It will enable you to push yourself as well as being a self motivating routine, that will encourage you and at the same time demand more out of you, challenging yourself and bringing the best out of you... this is both safe and fun. So often individuals spend time in the gym lifting weights through almost every exercise. This forces the muscles to adapt to the heavy lifting and although it expands the muscle, the muscle in return relies on this heavy lifting on a daily basis to maintain size and shape. Calisthenics however is the the increase usage of things we do daily and just don't notice. Therefore when we do calisthenics and take a day off we are still working that muscle area when we do regular activities such as, push a door open, climb stairs, power walk or even getting up out of a chair. while the weight caters to power the work of calisthenics would more cater to strength. 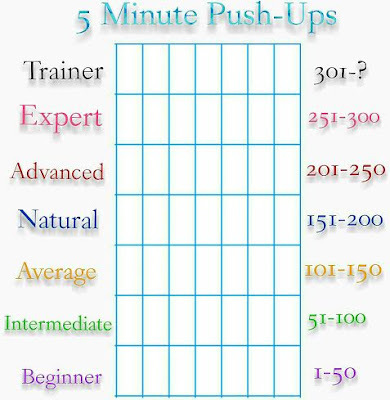 Set a timer for 5 minutes and see how many push-ups you can do. There are many routines to choose from such as: doing as much as you can on the first set, or pace yourself by setting a mark like 30 and try to hit that mark on every set, you can take breaks in between for as long as you'd like but whatever you do DON'T STOP THE CLOCK... and when you've finished the exercise log back on and tell us how you did, are you ready? I did 72 "girl" push-ups. Does that count? Yes that counts, 72 would put you at intermediate... do you think you can make it to average by the end of the month?